So in our last workshop we discussed what causes dysfunctional movement leading to those chronic injuries that prevent you from training and keep you coming back for treatments, stop you from getting the most out of you. If we look at the three-layer pyramid of dysfunctional movement – Pain, Bio-mechanical Blockages and Bad Habits. Pain being the biggest layer with the most drive towards dysfunction leading to bio-mechanical blockages further leading to bad habits. When you have pain during any movement there is a protective mechanism which stops some motion in a joint causing bio-mechanical blockages. 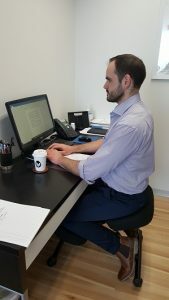 When a blockage occurs because further compensations occur with movement it leads to bad habits both in movement and with just holding your body in a way to ease the pain. Poor habits lead to poor posture. 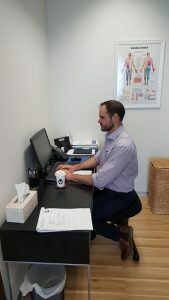 Having poor posture in a standing and seated position leads to further mechanical blockages and pain. So what is the correct posture to be sitting in or standing? When sitting find a position that allows the thigh to drop 30 degrees below the position of the hips. This allows the spine to align and make it harder to slouch. This position allows the muscles of the spine to be placed at ease. 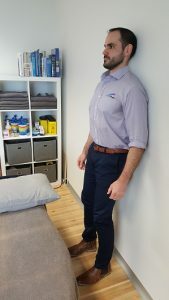 While standing make sure that you have even pressure on both feet, tighten the abdominal muscles and pin shoulders back with a slight chin tuck. There are a few things that you can do on a daily basis to help improve posture. Try this exercise at least 3 times a day and see if some of your aches and pains alleviate. 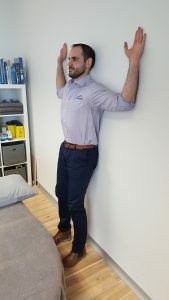 Stand up against the wall as shown in the photos below, trying to maintain contact with the wall and your lumbar spine, scapula, elbows, wrists and the back of your head. For some this may be easy to achieve, for others it may be quite a task. This is where it will be up to your discretion to decide how long you should try maintain this position. Start with 30 seconds, and if it comes easy, try progress by keeping contact with the wall and sliding down into a squat. 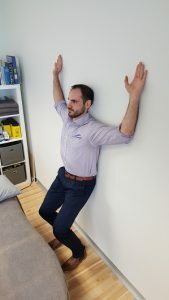 Gradually progress to a couple of minutes 3 times a day, or you can try wall angels where you keep this starting position and raise your arms so that your hands touch each other above your head. Both of these exercises will help alleviate poor posture related aches and pains. Let us know how it goes!